2013-2014 - Attendance includes one game at Michigan Stadium. 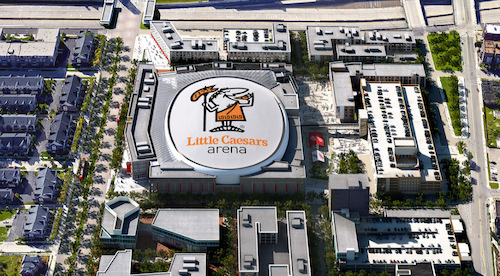 Little Caesars Arena is a multi-purpose arena under construction in Midtown Detroit. Construction began on April 24, 2015 following a formal groundbreaking ceremony on September 25, 2014. Scheduled to open in September 2017, the arena, which will cost $862.9 million to construct, will succeed both Joe Louis Arena and The Palace of Auburn Hills as the homes of the Detroit Red Wings of the National Hockey League (NHL) and the Detroit Pistons of the National Basketball Association (NBA), respectively. The arena will feature a unique, glass-roofed concourse connecting it to offices and shops surrounding it. It will anchor a new $1.2 billion 650,000-square-foot (60,000�m2) sports and entertainment district in and around downtown Detroit that will include mixed-use neighborhoods with new residential and retail outlets located around the Cass Corridor, Ford Field and Comerica Park. With the announcement that the Pistons would also move to the arena, it will mark the first time that the Pistons have played regularly in Detroit since 1978. BALLPARKS.com © 1996-2018 by Munsey & Suppes.